A small collection of magnificent images of the Tasmanian East Coast that includes Mt William National Park with the Picnic Rocks and Eddystone Point, Bay of Fires and Binalong Bay, Coles Bay, Wineglass Bay and the Hazards in the Freycinet National Park and Tasman National Park. Freycinet is a national park on the east coast of Tasmania, Australia, 125 km northeast of Hobart. It occupies a large part of the Freycinet Peninsula, named after French navigator Louis de Freycinet, and Schouten Island. 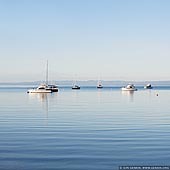 Bordering the national park is the small settlement of Coles Bay, and the largest close town is Swansea. Freycinet contains part of the rugged Tasmanian coastline and includes the secluded Wineglass Bay, voted by several travel authorities as one of the world's ten best beaches. Famous features of the park include its red and pink granite formations and a series of jagged granite peaks in a line, called "The Hazards". Founded in 1916, Freycinet is Tasmania's oldest park, along with Mount Field National Park. The park is famous for Wineglass Bay, just one of its white sandy beaches and the pure clear turquoise waters that are perfect for sea kayaking, swimming and scuba diving. The Hazard Range offers climbing, abseiling and mountain walking, and the coastal heathlands have wonderful day walks. The Bay of Fires is a bay on the northeastern coast of Tasmania in Australia, extending from Binalong Bay to Eddystone Point. The bay was given its name in 1773 by Captain Tobias Furneaux in Adventure, who saw the fires of Aboriginal people on the beaches. The Bay of Fires is a region of white beaches, blue water and orange-hued granite (the color of which is actually produced by a lichen). The northern section of the Bay, from north of the outlet of Ansons Bay to Eddystone Point lies within the Mount William National Park. The middle section of the Bay of Fires lies in the vicinity of Ansons Bay. It can be accessed via Policemans Point or the northern shore of Ansons Bay. The southern section of The Bay of Fires is in the Conservation Area, situated along a 13 km stretch of coast between Binalong Bay and The Gardens. Located in the far north-eastern corner of Tasmania, Mt William National Park is a protected stronghold for the Forester Kangaroo, the only large kangaroo found in Tasmania. Comprised of coastal heathlands and woodlands and vast sand dunes meeting pristine beaches, the 13,899 hectare park is a haven for native wildlife and birdlife - it is visited by more than 100 species of birds. Looking north from the beaches of the Bay of Fires as you stand on the dramatic boulders tumbled across the beach, you can see Eddystone Point Lighthouse, situated 15 kilometres north of Ansons Bay, a quiet, sleepy and isolated hamlet of fishing shacks. The massive crystal lenses of the 42 metre-high granite lighthouse once beamed 26 nautical miles to sea, guarding the entrance to Banks Strait and guiding ships past the offshore hazards of Victoria Rocks, Georges Rocks and Black Reef. Just two kilometres off-shore, the aptly named Black Reef was a curse to generations of sailors, claiming some of the 30 vessels shipwrecked along this coastline between 1846 and 1963. Situated within the Mt William National Park, Eddystone Point is called Larapuna in the local Aboriginal language. In 2006, the Tasmanian Government issued a 40-year lease for the Larapuna lands, and today the traditional owners are restoring the historic lighthouse keeper's cottages surrounding the magnificent lighthouse. Eddystone Point features a pretty picnic area and pleasant beach, and is a popular spot for anglers - crayfish, abalone and a wide array of fish species are plentiful here. The Bay of Fires has been luring holiday makers for decades. Named by 'Lonely Planet' in 2009 as the world's hottest travel destination, the Bay of Fires has to be included on your Tasmanian holiday itinerary. It is an area of idyllic white-sand beaches, placid lagoons and hidden coves with suitable accommodation choices and fishing and diving facilities. This world famous pristine white beach extends for over 50 kms from Binalong Bay in the south to Eddystone Point in the north. The easiest way to reach it is to drive to Binalong Bay from St Helens (C850), from which you can continue north as far as the small settlement of The Gardens (C848). It's a made road as far as Binalong Bay then mostly a gravel road from Binalong Bay to the Gardens. The Tasman Peninsula lies south and west of Forestier Peninsula, to which it connects via an isthmus called Eaglehawk Neck. 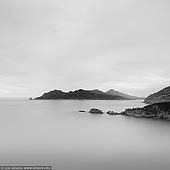 This in turn is joined to the rest of Tasmania by an isthmus called East Bay Neck, near the town of Dunalley. The Conservation Park, located on the main highway at Taranna, is a popular local visitor attraction along with the Port Arthur Historic Site and a number of beaches. The Tasman Peninsula is well known for its rugged eastern coastline, and much of it is now the Tasman National Park. At Eaglehawk Neck are many strange rock formations, including The Devils Kitchen, Tasman's Arch, Blow Hole and the Tessellated Pavement. Further south are the highest sea cliffs in the southern hemisphere, rising 300 m (980 ft) above the Tasman Sea at Cape Pillar. The peninsula is claimed to have some of Australia's best surf spots at Cape Raoul, Roaring Beach & Shipstern Bluff.